TORONTO — Energy stocks helped push the Toronto stock market lower Thursday as concerns about oversupply pushed crude oil prices below US$75 a barrel for the first time in four years. The S&P/TSX composite index dropped 75.96 points to 14,780.24. The Canadian dollar declined 0.47 of a cent to 87.9 cents US. New York's Dow industrials gained 40.59 points to 17,652.79, the Nasdaq rose 5.01 points to 4,680.14 and the S&P 500 index was 1.08 points higher at 2,039.33. The energy sector was the leading TSX decliner, down 2.9 per cent as crude oil prices fell $2.97 to US$74.21 a barrel. The latest drop came as the U.S. Energy Information Administration said U.S. oil supplies decreased 1.7 million barrels last week, much more than the 500,000 barrel drop that analysts had expected. However, gasoline inventories rose by 1.8 million barrels against an expected 280,000 decrease. Oil has been trading at or near multi-year lows amid slow economic growth in many regions and increased U.S. production. But many analysts think the move down has been overdone and economic fundamentals suggest oil should be around $90 a barrel. In fact, lower prices could create the conditions that would send crude higher. "We think North American producers will start scaling back production in a meaningful way,'' said Alison Mendes, portfolio manager at Manulife Asset Management. Mendes said falling prices will force marginal producers to stop producing or cut back. The gold sector was down about 1.25 per cent even as December bullion in New York rose $2.40 to US$1,161.50 an ounce. Gold prices have been under extreme pressure lately, heading steadily towards the US$1,100 mark, amid an end to the U.S. Federal Reserve's latest quantitative easing program, a higher U.S. dollar and low inflation. As a result, gold stocks have also suffered and the TSX gold sector has plunged about 14 per cent in the last month. After the close Wednesday, Iamgold Corp. (TXS:IMG) posted a quarterly net loss of US$72.5 million or 19 cents per share, compared with net income of US$25.3 million or seven cents a share a year ago. Revenue rose to US$341.5 million from $293.5 million but the average realized price per ounce fell to US$1,277 from US$1,334. Its shares fell 21 cents or 9.7 per cent to $1.96. The base metals component dropped 1.2 per cent while December copper was unchanged at US$3.02 a pound. The tech sector was positive as IT services company CGI Group Inc. (TSX:GIB.A) said that earnings ex-items were $234 million or 73 cents per share — in line with estimates. Revenue was $2.48 billion — up about $25 million from a year earlier but short of the analyst estimate of $2.57 billion. Still, its shares gained $1.09 to $40.55. BlackBerry (TSX:BB) was ahead 7.7 per cent at $13.74 as the company announced it was partnering with rival smartphone maker Samsung Electronics Co. in an agreement that will see it provide mobile security technology for the Android operating system. 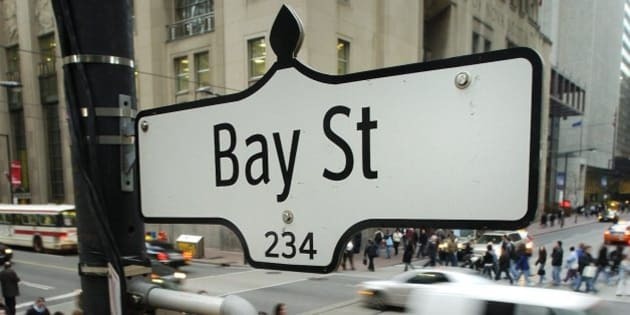 Financials were positive but shares in Manulife Financial (TSX:MFC) were off seven cents to $21.60 as the company reported quarterly core earnings of $755 million or 39 cents, up 7.4 per cent from a year earlier but a penny short of estimates. Manulife's net income was $1.1 billion or 57 cents per share, much higher than the 26 cents that analysts had expected.